HBO’s new series Westworld has probably got a lot of people reconsidering their most recent Grand Theft Auto V murder spree. Reconsidering, though probably not regretting. On the one hand, the first two episodes of HBO’s new sci-fi drama have asked us to at least entertain the idea that the computer-controlled civilians we just mowed down have personalities and inner lives. On the other hand, it comfortingly shows us a fictional form of entertainment so far advanced beyond modern video games that we won’t lose much sleep over the virtual citizens we just killed. Our current video game moral quandaries remain safely abstract and philosophical. GTA’s androids do not yet dream of electric sheep. Westworld’s setup, briefly: At some unclear date in the future, enterprising content creators have devised a wild west theme park populated by remarkably lifelike androids. Human “guests” pay an astronomical fee for the freedom to walk amongst the synthetic “hosts” and do whatever they want, which usually means screwing or murdering everything in sight. As the show begins, the hosts have begun to exhibit erratic behavior as the result of a software update. By the end of the first episode, it’s clear that the synthetic hosts are in the early stages of widespread self-awareness. Given how they’ve been treated by the park’s guests over the years—raped, tortured, and murdered over and over again—that awakening is likely to involve some retribution. In the second episode, we get to see Westworld through the eyes of a first-time guest named William. Before he is set loose, William asks if there’s some sort of orientation. “No orientation,” his host responds. “No guidebook. All you do is make choices.” Sounds familiar, right? As it is imagined on the show, Westworld is a fanciful but in many ways logical endpoint for the current trajectory of emergent, open-world games. The artificial intelligence and world construction are so advanced that there’s no one narrative for players to follow, just a world filled with stories to uncover. All you do is make choices. Because of this framework, Westworld is explicitly a show about gamers and game designers. Many of us have taken a turn as Ed Harris’ Man in Black, putting on our bandana in Red Dead Redemption and shooting up a saloon. Maybe we left a bound woman on train tracks just to earn the Achievement. Harris’ scenes are filmed with such casual cruelty that they’re hard to watch. I imagine that’s the point, but it doesn’t make his scenes go down any easier. The Man in Black may seem like a monster, but in a lot of ways he’s just another gamer. He’s just playing the “game” of Westworld more actively than any of the other human guests. After 30 years coming to this place, he’s moved on from traditional gameplay and begun hunting secrets and easter eggs. He’s searching for some mythic second layer, a labyrinth within the game. Many a gamer can tell you that once they get tired of staging ever-more-elaborate heists and shootouts, the next level of a game often involves trying to creatively break it. Meanwhile behind the scenes, the central conflict between Westworld’s staff involves a debate about narrative design. The park’s lead writer Lee Sizemore pitches a particularly blood-drenched story for the new “season” of Westworld, but the park’s founder, Anthony Hopkins’ Dr. Ford, shuts him down. Ford says that people don’t come to Westworld for the stories they can be told, but rather for the stories they themselves can tell. Similar disagreements have doubtless been hashed out in many a video game writers’ room. “The city looks beautiful if you just slow down and take your time,” Joy responded. She’s right. The city does look beautiful if you just slow down and take your time. I remember forcing myself to walk the entire circumference of GTA V, slowing down whenever possible to take in the sights and sounds. It took me several hours. The amount of detail in that world is jaw-dropping, and we so often miss it because we’re too busy with our nose in a mini-map, cruising to our next mission, our next destination. Here at Kotaku, I write a tongue-in-cheek series called “The Secret Lives of NPCs.” In addition to walking around and sightseeing, I like to consider the non-player characters I’ll find standing around. What must their lives be like? What do they do when I’m not around? I celebrate the Assassin’s Creed guy who exists solely for us to knock him into the Thames. I apologize to the Hitman cook I’ve clubbed with a hammer so many times. I have fun with these articles, but I’ve always been aware of their darker subtext. These fake people exist solely to have violence perpetrated against them or, at best, to bear witness to violence perpetrated against others. Westworld makes that subtext explicit in an upsetting and provocative way. The more realistic video games become, the more challenging it will be to approach them with the same cavalier “do whatever you want” attitude with which we approached Grand Theft Auto III back in 2001. 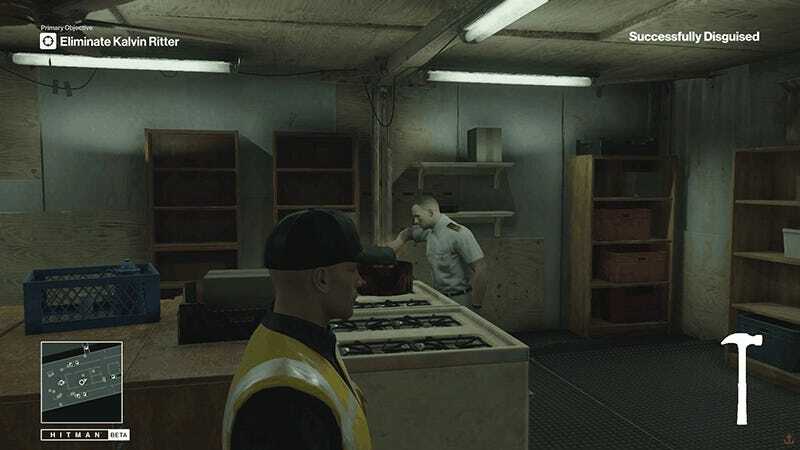 When the airport civilians screamed and ran in Modern Warfare 2’s infamous 2009 “No Russian” level, it was genuinely disturbing. When a 2014 upgrade to GTA V let us maraud around in first-person, violence against the virtual citizenry felt shocking and transgressive in a way the series hadn’t managed in years. The more advanced this technology gets, the more obviously horrifying some of our in-game actions will be. It’s one of the most interesting questions Westworld asks about artificial intelligence and game design. We’ve been trained to see video games as contraptions to be manipulated and mastered. Game-makers often add a veneer of humanity to their systems; they give their logic puzzles personalities and make the target dummies scream and bleed. Game players, on the other hand, are skilled at stripping those layers of humanity away to better focus on the systems within. In many video games, NPCs are little more than cordwood to be chopped and stacked and re-arranged as we see fit. They don’t matter. Westworld questions that premise, offering a pointed critique of modern AAA game design by imagining and interrogating the games we might one day play. If an artificial intelligence were sophisticated enough, would it fundamentally change the way we interact with it? If you remove enough layers of abstraction, are people less willing to inflict harm on an artificial construct? Or is the opposite true? Will we gradually become so desensitized to this stuff that we will become the Man in Black, inflicting the most outrageous pain imaginable in the pursuit of something we haven’t seen or felt before? What will it take to shock me now? These days when I watch a clip of “No Russian” I don’t see screaming civilians; I see strained seams. I notice how cynical it is, with its obvious attempts at manipulation. I’m similarly less shocked by GTA V’s first-person violence than I was the first time I saw it.